September is Childhood Cancer Awareness Month and it is timely that Childhood Cancer 2016 takes place 5th – 7th September. This conference is an important opportunity for us to talk about childhood cancer. Childhood Cancer 2016 has a very different flavour to our previous conferences, which have focused on the aetiology of childhood cancer. This year we are looking at how new developments in translational science are being harnessed to improve survival and quality of survival for children with cancer. We will start the conference by considering, on day one, the potential of precision medicine to improve the outlook for children with cancer in the UK, discussing the promise and pitfalls of making DNA sequencing available for all young cancer patients. Children with Cancer UK has recently committed funding to support the preliminary stages of rolling out sequencing across the UK and as part of his day one talk Dr Darren Hargrave will discuss plans for the implementation of this work. On day two, attention will turn to immunotherapy as we hear from world-leading experts about the remarkable success that is being achieved in the US and here in the UK. On day three we will revisit the question of causation, what is known about influenceable causes of cancer and what steps can realistically be taken to reduce the incidence of cancer in children and young people. 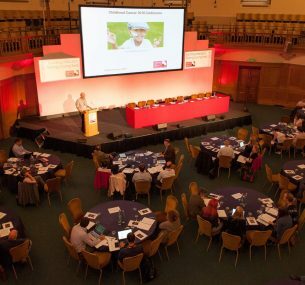 With an exciting combination of invited speakers, free communications and panel debates – our aim is for Childhood Cancer 2016 to support a two-way dialogue – or indeed a multi-way dialogue. With a broad mixture of scientists and clinicians joining us from the UK and overseas (and we are pleased to welcome speakers and delegates from the US, France, Germany, Italy, Greece, Brazil and Pakistan), the conference will facilitate the sharing of information and knowledge and provide a forum for networking and discussion. 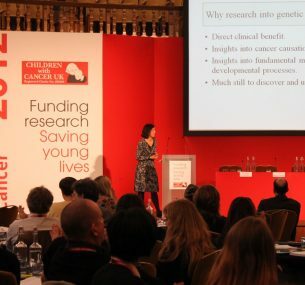 Importantly, we see the conference as a key opportunity to engage with the childhood cancer research community and garner their views on how we work and what we should be funding. We will be actively seeking input into the development of our new research strategy. We are delighted that many of our grant-holders are joining us to showcase some of the work that we are funding. For those who were unable to join us, the sessions and much of the content is be available on our Conference website. Have a look!